TV Fashion Recap is a biweekly column featuring the best of TV fashion. Every other week, we recreate our favorite outfits from the most recent episodes of all of the hottest shows. Stay tuned; we may feature your favorite show next! Every other week, I break down the best of TV fashion, featuring my favorite looks from the last two weeks. The end of November is usually a TV dead zone full of reruns, but there was no shortage of great fashion this week, especially on Bones and Once Upon a Time. Read on to check out the outfits! 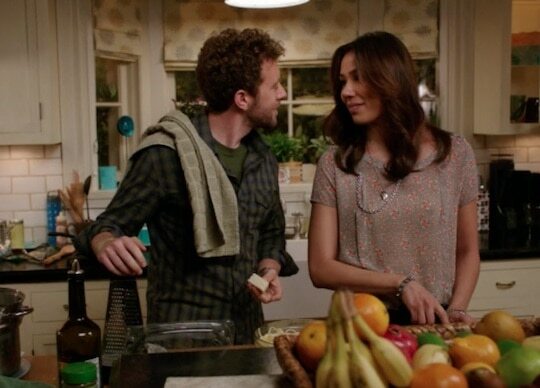 Fox’s popular crime show Bones has long been one of my favorites. We recently featured it in a Geek Chic post, but for those of you who haven’t watched it, it’s about Dr. Brennan, an anthropologist, who’s partnered with super hot FBI Agent Seeley Booth to solve murders. Angela is a gorgeous artist who works in a lab for Dr. Brennan. She does a lot of 3D modeling of the crimes, but she occasionally breaks out some crazy hacking skills. Angela’s style is very eclectic, as we mentioned in the Bones Geek Chic post, and she tends to favor a mix of bohemian pieces and trendy, sophisticated touches. When I saw her colorblocked dress and intricate jewelry in this episode, I immediately fell in love! It was a little different than what she normally wears, but she looked so effortless and put together. To recreate Angela’s look, start with a red tank top. Add a high-waisted burgundy skirt; this one’s high-low cut is reminiscent of Angela’s earlier, slightly hippie-inspired style. Next, slip on a pair of tan flats. Add some girly, yet earthy jewelry to capture Angela’s look and free spirit; browns and mixed metals are great! Don’t forget to add a long, dangly necklace to break up the color blocking. To make this outfit more fall-friendly, you can add a light colored cardigan or blazer. 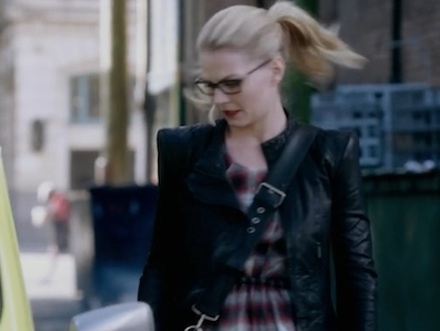 I’ve already gushed about ABC’s Once Upon a Time and Ruby’s style, but when CF reader Adi suggested I take a look at Emma’s fashion from this episode, I immediately fell in love with her look and had to feature her this week! Emma is definitely one of my favorite characters on TV. She’s tough as nails, fiercely protective of her friends, and will go to the ends of the Earth for her son, Henry. This episode gives glimpses into her troubled past, and shows us her vulnerable side. We also get to see some fab fashion choices – in this episode, Emma diverges from her usual jacket and jeans combo (which I still love), and sports more feminine, flirty outfits. 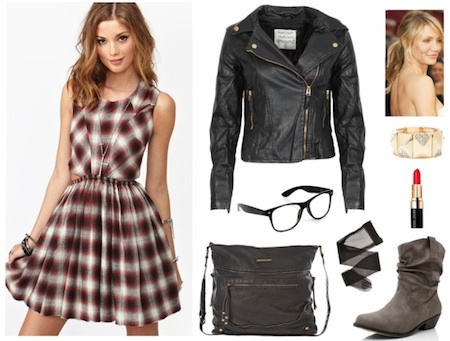 To recreate Emma’s slightly grungy, yet cute and casual look, start with a pretty plaid dress. Next, add a dark leather jacket for edgy contrast. Slip on some tights and dark grey ankle boots to make this outfit perfect for colder days on campus. Now it’s time for the extras. Add a dark leather bag for all of your essentials; Emma kept a device for stealing cars with her, but I’d opt for a notebook and laptop. A coat of red lipstick adds a pop of color, while a sparkly gold pyramid bracelet lends a fun, girly touch. Finish with thick rimmed glasses and a high, wavy ponytail hairstyle. What do you think of these looks? Which one is your favorite? Did we miss any amazing outfits from the past week of TV? Which shows do you think deserve a spot on the next TV Fashion Recap post? Leave a comment below and tell us what you think!